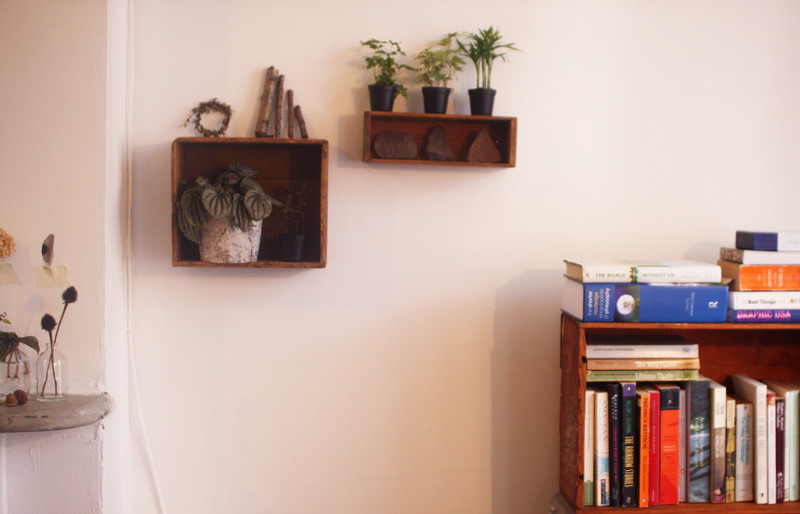 This isn’t really a :make: post in that it’s not a step-by-step DIY and there’s really no ‘making’ involved in constructing these shelves, but it’s just an idea I thought I would share with you! I’ve wanted what I call a ‘plant wall’ in our apartment since we moved in, inspired by this beautiful image and by all the plants, cuttings, sticks and stones I’m endlessly collecting! These two shelves are just the beginning and I hope to add to it over time with other shelves and bits and pieces and watch it grow. I picked up these two vintage wooden crates at a flea market, but you could also find similar ones at swap meets or antique stores. I tend to pick up wooden boxes of all shapes and sizes whenever I find nice ones at a reasonable price (or even sometimes on someone’s verge for free – yippee!) as they’re endlessly useful for storing and displaying all sorts of things. 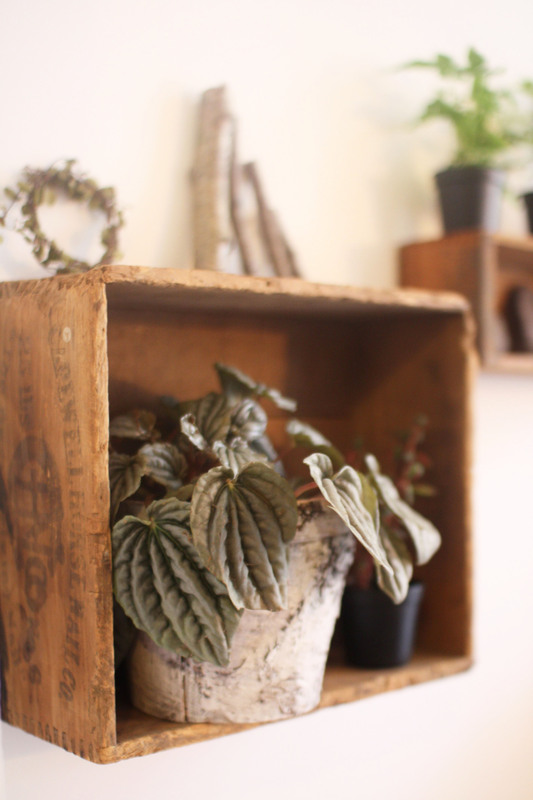 I particularly love using sideways crates as shadowboxes on the wall because you get two surfaces – the inside of the box and the top – and you get the nice wooden surface behind your objects. As our walls here are plasterboard (as seems to be the case with most Brooklyn apartments), I was able to hammer nails straight through each crate into the wall, so attaching them took all of about ten seconds! If you have brick walls, I would recommend drilling two holes in the back of each box (one on either side), holding the boxes against the wall and marking where the holes are, then drilling matching holes in the wall and finally attaching your shelves with screws through the holes. 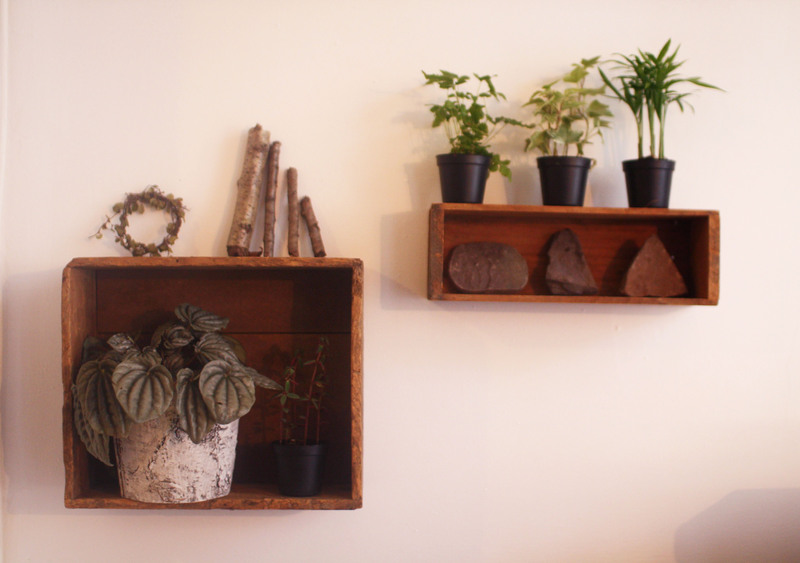 Once they’re up you can fill your shelves with plants or anything else that takes your fancy! 14 Sep	This entry was published on September 14, 2013 at 2:26 am. 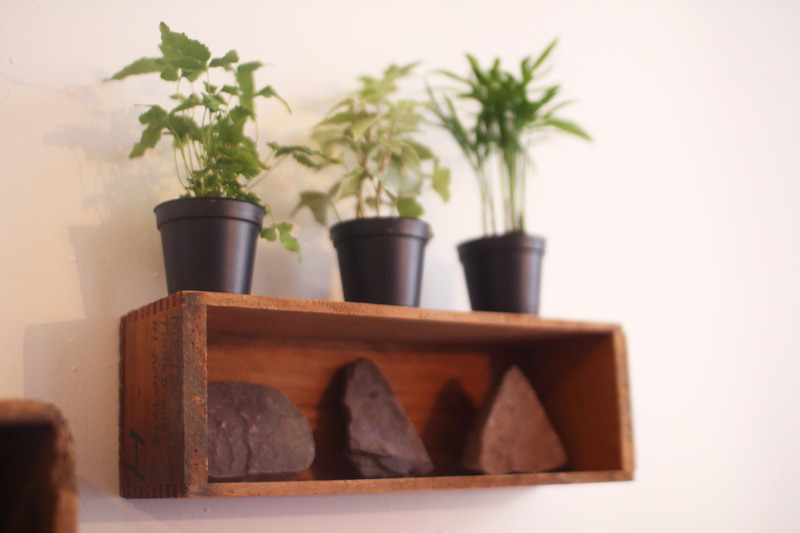 It’s filed under make and tagged brooklyn apartments, DIY, green, home, make, new york, wooden boxes. Bookmark the permalink. Follow any comments here with the RSS feed for this post. Looks very natural and lots of potential for updates and creativity.